Here is some pictorial proof that you don’t always have to have seeds from streaked hostas to end up with streaky seedlings. These little streaked beauties grew from seeds I had collected from a number of hostas… but none of those hostas were visibly streaked. 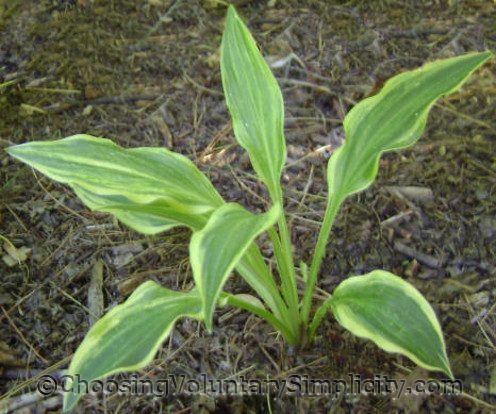 I have also had many seedlings with variegated edges and some center variegation… again from seeds from solid color hostas. I wonder if it’s possible that each hosta has many more possibilities in its genes than the readily accepted ones and that when seedlings are culled early, many of these possibilities are never realized. These seedlings are now just past two years old and have been very slow growing, but they have always been vigorous and healthy, so I think they will just be smaller hostas. 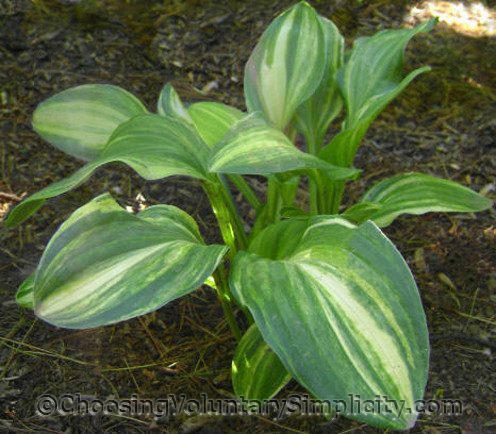 I was thrilled when I first saw the hint of green and white variegation in their leaves, because it is supposedly extremely rare to get a streaked seedling from a solid color hosta. Actually, several of the seedlings in this group started out with leaves of two colors, and they really stood out against the rest of the all-green seedlings in the flat, but all the seedlings except these two lost their streakiness as they matured. These two stayed streaky and their colors have intensified. Both seedlings blossomed but did not produce seed pods this year, but that might have been because of the exceptionally wet summer that we had. I will really be interested to see if they eventually produce streaky seedlings themselves, and if they do, if the streakiness is a lasting one. Those are some pretty seedlings. I did not know that it was possible to get streaked seedlings from ordinary hostas. I’m just starting to get interested in planting hosta seeds and haven’t actually done it yet but I am reading all your articles and collecting information – and a few seeds. I’m excited to see what I can grow. Your seedlings from plain hostas are more streaked than the seedlings I grew from streaked hosta’s seeds. I bought these seeds on an exchange and only 2 of the seeds germinated. I don’t know if the seeds were any good or if I did something wrong but my 2 seedlings are so far plain green. Wow! Those are some great looking streaked seedlings! I’m interested in what you wrote about there being more possibilities in the hosta than show up right away. I’ve thought that myself and I don’t cull my seedlings either and I’ve had some pretty interesting specimens that didn’t actually look interesting until they were a couple of years old. I am really enjoying your hosta articles and the rest of the articles too but my primary interest is hostas so I enjoy those the most. Thanks for putting in so much work and sharing so much information. I read somewhere that Revolution is one hosta that can produce streaked seedlings but I have planted dozens of Revolution seeds and have yet to get a streaked seedling. I guess it may depend on the hosta itself.